The crash of the US-made C-130J Super Hercules, a special operations plane, on March 28 has raised a question mark over the clean chit given by the Indian Ministry of Defence to the plane-maker, Lockheed Martin. A committee of the US Senate in its probe had found that “counterfeit parts” such as memory chips supplied by a Chinese company were used in C-130J planes produced between a specific period. Five Indian Air Force personnel had died when the plane, costing some Rs 730 crore, crashed 72 miles west of Gwalior. India has five more such planes and ordered six more. It is not established yet if any of the counterfeit parts caused the crash. Faulty memory chips can cause the pilot display screen to go blank. The display provides information on engines, fuel, locations, altitude and warnings. The IAF plane reportedly hit a hillock in broad daylight. It was in 2009 and 2010, the same period when C-130J planes were produced for the IAF, when the US Senate said 1,800 incidents were detected in which more than a million fake parts had been sourced from China. In 2008, India signed a deal with the US for $962 million for supply of the first lot of six planes. In February 2011, India got the first plane which was manufactured in the same period when the probe was being conducted by the Senate committee. More than 16 months later in May 2012, the Committee of Armed Services on the Senate in the US came out with a report titled “Inquiry into counterfeit electronic parts in the department of defence supply chain”. It said “counterfeit” parts were used and supplied by a suspect company, Hong Dark Electronics, in China to a US company for further supply to Lockheed Martin. The US Senate report in May 2012, some six months before this announcement in Parliament, blamed China saying: “The suspected counterfeit electronic parts used on the C-130J’s originated with a company in Shenzhen China called the Hong Dark Electronic Trade Company. Hong Dark sold these parts to Global IC trading group in the US”. The trading group supplied it to L3 communication display system, which provides the displays to Lockheed Martin. It was in 2010 that engineers of the ‘L3’ learned about the high rates of failures while integrating the systems. The counterfeit memory chips had markings of being produced by Korean giant Samsumg. In its testimony to the US Senate, Samsung said the chips were produced more than ten years ago and it could not comment as it did not know how these were stored or used. The Senate referred to a test report saying these were “not factory originals”. Lockhheed Martin’s engineers raised the issue with the US Air Force in November 2010, but the Senate blames the company engineers of leaving the US Air Force with the false impression that these were not counterfeit. The US Senate studied other equipment also. 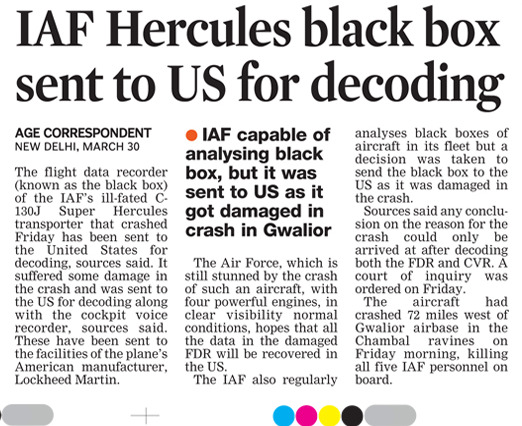 The black box of the C-130J transport aircraft that crashed near Gwalior on Friday has suffered damage and the Air Force has sent it to the US to seek the assistance of its manufacturer Lockheed Martin in decoding the data, IAF officials said today. The connectors of the Flight Data Recorder or the black box are damaged along with the card inside the Cockpit Voice Recorder (CVR). 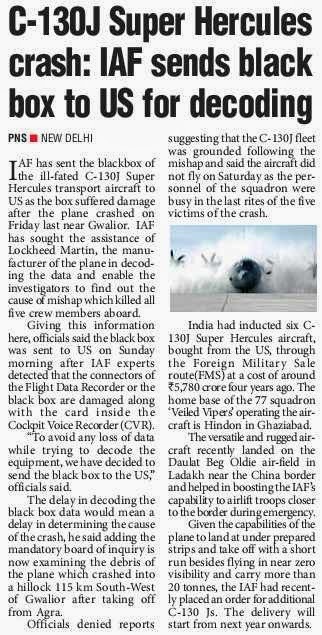 “To avoid any loss of data while trying to decode the equipment, we have decided to send the black box to the US,” an IAF spokesperson said here. The black box was sent by an early morning flight today to Lockheed Martin, he said. The delay in decoding the black box data would also mean a delay in determining the cause of the crash, he said. With the UPA-II's tenure coming to an end, France had wanted India to sign a pact to provide government guarantee for completion of negotiation for 126 fighter aircraft with Dassault company but Defence Minister AK Antony has refused to do so. France, whose company Dassault has been shortlisted for supplying the multi-role medium combat Rafale aircraft, had proposed the signing of the agreement apparently to ensure that negotiations for the multi-billion dollar deal do not get affected if a different party comes to power after the Lok Sabha elections. "The French side wanted government guarantee to the negotiations," sources said. Antony, however, refused to sign such an agreement, arguing that governmental guarantee cannot be provided as negotiations were still underway, they said. 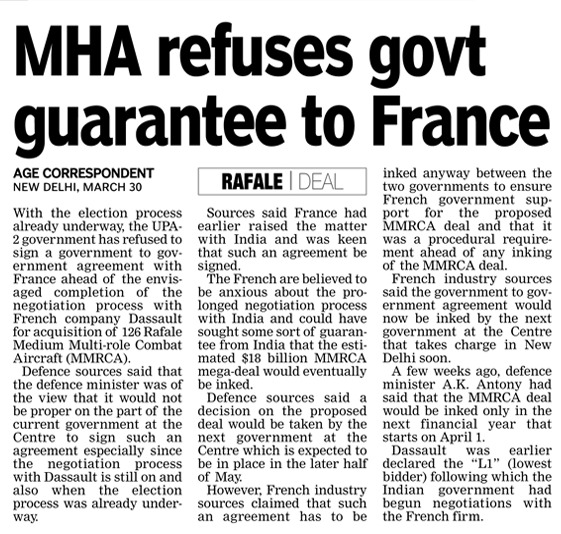 The Defence Ministry is still negotiating the price and terms and conditions of the contract with the French firm Dassault Aviation, whose Rafale combat aircraft was selected as the lowest bidder two years ago for supplying 126 warplanes. Antony had recently ordered that the process to arrive at the lowest bidder in the multi-vendor tender be reviewed after completion of the whole procedure involved in the procurement as questions had been raised over it. The two sides are trying to tackle the issue of life cycle costs (LCC) relating to Rafale. "There are complaints about the procedure of calculating the life cycle cost and that issue is not yet settled. Before bringing the deal to the Cabinet Committee on Security for final approval, we would like to get clear on that aspect," he had said. As per the Indian defence procedure, the firms offering lowest prices and meeting the requirements of the respective services are given the contract and in this deal to procure 126 combat aircraft, LCC has been taken into view to determine the lowest bidder. Congratulations on being appointed as the new Prime Minister of our country. You have an onerous task before you, for you have a lot to undo what your predecessor and his colleagues and advisers have done or not done, before you commence governing the nation. I am convinced that you will have the intellectual and moral capacity to take the nation forward. There are many areas of good governance that will need your attention. These include the economy as well as the rampant corruption in the government. However, the subject I am bringing to your notice is the precarious state of “national security,” which is perhaps the most important and hence, I am bringing it to your focus at this early stage of steering the nation over at least the next five years, if not more. There are three broad facets of national security that need to be discussed. These are the current state of the Indian military, the abysmal lack of any national security strategies and the rapidly deteriorating civil-military relations. All three will need your urgent attention as these are issues of the utmost importance if the nation has to progress in a secure environment. The Indian military has probably reached its lowest point since the major debacle of 1962 and for similar reasons that prevailed at that time. It was the gross neglect of the armed forces that had resulted in the humiliation of 1962 and history is apparently being repeated once more. In the last ten years, the military has again been starved of funds. These have been diverted to launch populous measures, which encourage corruption and help no one. Resultantly, little or no modernisation of the military has been carried out, no security-related policy initiatives have been started and the bureaucracy, with unfettered powers, has stifled the legitimate aspirations of the armed forces. The morale of the armed forces has fallen to extremely low levels and the country has become highly vulnerable to hostile actions by our adversaries. The defence budget has been steadily going down and presently stands much below two per cent of the GDP, when the accepted requirement is at least three per cent. The bulk of the allocations can only meet the revenue expenditure and what little is left for modernisation is conveniently siphoned back by the Ministry of Finance to balance its books and make additional funds available for dubious populous measures of the ruling party. The much vaunted procurement organisation of the Ministry of Defence (MoD), which has incidentally been reorganised at least six times in the last 15 years or so, has produced zilch. It is unable to expend even the meagre allocated capital budget. It is not that the armed forces do not plan adequately, but it is lack of commitment and understanding of matters military by the MoD, redundant procedures and sitting on files to make money on the side that are responsible for cases not fructifying. The army seems to have suffered most as far as modernisation is concerned, as its budgetary allocations have decreased considerably. The equipment state of the two fighting arms — armour and infantry — is abysmal. On paper, India fields a total of 3,274 tanks. Of these, only 485 T-90s and 124 Arjuns can be considered modern and even these have major problems like inadequate night fighting capability and sufficient ammunition and spares support. The equipment state of the mechanised infantry is similar. Tracked vehicles, which should have been replaced decades back, continue to be on the inventory of units. 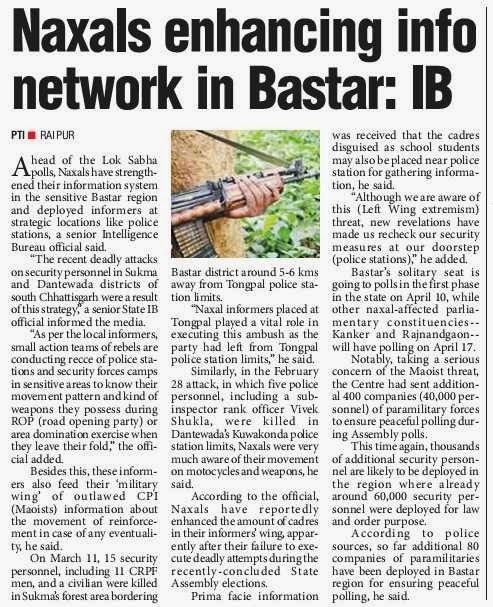 The infantry, which is the mainstay of the army, continues to be equipped with obsolete INSAS rifles. The much vaunted project of fielding state of the art modern infantrymen under the Futuristic Infantry Soldier as a System (F-INSAS) programme is way behind schedule. The infantry is also short of a large number of carbines, machine guns, anti-material rifles, mine-protected vehicles, night-vision devices, bullet-proof jackets and other equipment. Our special and airborne forces are still not equipped with appropriate weapons and combat systems. The sad saga of equipping the artillery with modern guns is too well known to bear repetition. The equipment state of the Air Defence Artillery is even worse, as they continue to field obsolete weapons of 1970's vintage. The Army Aviation Corps (AAC) continues to fly obsolete Chetak and Cheetah helicopters. For nearly a decade, there is only talk of procuring approximately 200 light utility helicopters, as contracts keep getting delayed or terminated. The navy is also badly off. The state of naval platforms, both surface and sub-surface is too well known in recent months to need any elaboration. The submarine arm is particularly badly off. A brilliant Chief of Navy Staff has had to resign owning moral responsibility because he has character, although it is not he who should have resigned but the Minister of Defence and the bureaucrats who could not provide equipment and spares, despite being constantly reminded of the bad equipment state. The state of the air force is equally precarious. It is desperate for more fighters. Its 34 squadrons will reduce to 26 in 2017, if the Medium Multi-Role Combat Aircraft, Rafael, is not inducted by then. There is urgency to replace the ageing MiG fighters, 482 of which have crashed in the last four decades. Their replacement, the indigenous Tejas fighters, continue to be on the assembly line, but none have been produced as yet. Joint endeavours remain frozen although everyone talks about them. A so-called Integrated Headquarters is in existence as a result of the recommendations of the Group of Ministers (GoM) of 2001, but it is headless as no Chief of Defence Staff (CDS) or Chairman Joint Chiefs of Staff has been appointed. The main reason is that the bureaucracy only believes in retaining and expanding its turf and powers and is least concerned with the security of the nation. The Department of Ex-servicemen Welfare is a joke, as it is more concerned with taking hapless veterans to courts instead of assisting them. The political leadership has long been blasé about the armed forces and prefers not to deal directly with the military hierarchy. Vintage structures continue and forming integrated theatre commands are only talking points in seminars. Despite a lot of lip service, we have not taken any serious actions to indigenise defence production. We continue to waste precious funds on inefficient and corrupt organisations like the Ordnance Factories, Defence PSUs and the DRDO, where middlemen rule the roost. We have ignored private companies which are efficient, have the expertise and are keen to produce defence equipment. One can continue in this vein and list out all structural and equipment weaknesses, but with no transformation, utter lack of any modernisation of weaponry, and existing shortages of all types of equipment and munitions, the Indian military is not in a position to fight and win battles and wars. We seem to have psyched ourselves to believe that our country will not be embroiled in any war, forgetting that our growth as a military power is an essential component of our ascendancy to “great power” status. No amount of economic development can be sustained unless it is underpinned by military security of a very high order. I appeal to you Sir, to set in motion urgent measures, on assuming office, to seriously overhaul the present defence machinery, modernise it and make it responsive to the needs of the Indian military and the nation. Urgent measures to be taken include the integration of Service Headquarters and MoD, simplification of financial vetting procedures, delegation of powers for capital procurements, increasing the processing capacity of the procurement authorities, proceeding rapidly towards joint endeavours, placing professional experts in important positions, setting in motion the comprehensive restructuring of ordnance factories, defence PSUs and DRDO, opening defence production to the trade and above all, having a continuing dialogue with the armed forces hierarchy instead of continuing with the present archaic and peculiar system of interacting with them through middlemen like bureaucrats, diplomats and other civil officials. The Indian military has proven its credentials of loyalty, apolitical demeanour and love for the country and needs to be trusted unequivocally. Jai Hind, Sir, and best wishes for a productive tenure. NEW DELHI: Popular culture in India has glorified the martial traditions of the Rajputs. One of which was saka, in which fighting men of a defeated state rode out for a final, suicidal battle dressed in yellow. That antiquated Rajput code has survived in the yellow ceremonial uniform of one of Indian Army's oldest cavalry regiments, the 1st Horse or Skinner's Horse. Over two centuries after it was raised by a "white Mughal" — James Skinner — who was denied a commission in the Honourable East India Company's army owing to his mixed blood (his mother was Rajput), very little of the regiment is known in India outside the armed forces. In the West, though, it continues to fire up popular imagination. For the last six years or so, a group of some 30 Englishmen and women — all heritage enthusiasts — has dedicated itself to the "recreation of the dash and glamour of one of the most famous Indian cavalry regiments of the time of the Raj". No, they have nothing to do with the Indian Army regiment; they are but a group of heritage enthusiasts. "We felt the need to educate the British people about the role and contributions of the Indian Army to what have always been perceived as Britain's wars. The British people have great admiration and respect for the Indian Army, but it is important to make our present generations aware of what the Indian Army did for us: we couldn't have won the two world wars without Indians," says Mike Trevor, who has assumed the rank of major. While Skinner's Horse's history is of great interest to the group, it is also dedicated to raising awareness about India's role in conflicts that are wrongly considered the white man's war. The group recently received funding from the UK Heritage Lottery Fund, and with 2014 being the centenary year of the First World War, the team plans to use the money to fund a memorial ride — "From the Sea to the Somme". The journey will commence in August at Nieuwpoort in Belgium and culminate at the river Somme, the scene of heavy fighting during WWI, in France two weeks later. En route, there will be a memorial service at the Neuve Chapelle Indian Memorial in France to mark the sacrifice of the 4,742 Indian soldiers and labourers killed on that front. But there is a problem. "We haven't found any Asian rider to join us on this memorial ride. It's very important that we find some. I am sure we wouldn't have faced this problem if we had done it in India; the 61 Cavalry would have certainly helped us," says Trevor, who got married at St James' Church in Delhi a few years ago in full regimental uniform. Over 1.3 million Indian soldiers had participated in the First World War to defend, quite ironically for a colonised nation, liberty and democracy in Europe. Seven Indian expeditionary forces named A to G took part in different theatres of the war — in Europe, the Dardanelles and Gallipoli, Egypt, Mesopotamia and the Middle East, east Africa, and even China. Indian cavalry regiments participated with distinction and glory in the western front and the Middle East. In fact, the infantry divisions were withdrawn towards the end of 1915, but the cavalry corps stayed on until 1918. And in doing so, they left an indelible mark on European history: the last cavalry battles ever on western European soil were fought by Indian lancers and sabre men. What is India doing in remembrance of the feat? "We are not participating in the centenary celebrations. We don't have much recorded history or photographs of our regiment's participation in the war; we do have records of Second World War. Also, we are mostly concerned with whatever the regiment has done post Independence," says Colonel Amit Sood, the commandant of Skinner's Horse. It's surprising why the regiment is not in a remembrance mode when it had won the battle honours 'France and Flanders' in the Great War. Dominiek Dendooven, researcher at In Flanders Fields Museum and celebrated author, disagrees with this dismissive view India has of her history. "This is the only time your history meets ours. And it's remarkable it happened 100 years ago when transport and communication were not as developed as they are today, and racial bias existed in every sphere. Without India, the war might have ended in a resounding German victory and altered the course of history. Indians decisively intervened for Europe. And neither we nor you should forget that," he tells TOI. In that context, the words uttered by Marshal Ferdinand Foch of France at the unveiling of the Neuve Chapelle Indian Memorial in 1927 are unforgettable: "Return to your homes in the distant, sun-bathed East and proclaim how your countrymen drenched with their blood the cold northern land of France and Flanders, how they delivered it by their ardent spirit from the firm grip of a determined enemy; tell all India that we shall watch over their graves with the devotion due to all our dead. We shall cherish above all the memory of their example. They showed us the way; they made the first steps towards the final victory." We in India simply forgot to spread the word. The crash of a recently acquired C-130J 'Super Hercules' transport aircraft in the Chambal region — killing all five personnel on board — adds to growing worry over India's alarming loss of military hardware during peace time. That the C-130J has the best safety record among military planes worldwide makes the accident even more baffling. While only a thorough probe into the incident can ascertain reasons behind the crash, scrutiny of maintenance and handling procedures is urgently necessary. Over the years, the IAF has lost too many servicemen and aircraft to such mishaps. Unless rectified forthwith, the problem poses a serious threat to the country's defence preparedness. Nor is the issue specific to IAF. The C-130J crash comes on the back of a series of accidents in the navy — starting with the INS Sindhurakshak explosion in August last year to the INS Sindhuratna mishap in February — that forced navy chief D K Joshi to resign. In fact, with several of India's submarines being phased out, the navy's undersea capabilities are slated to hit a historic low by 2015. 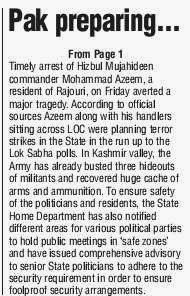 At the same time, the army is faced with a major shortage of ammunitions. Along with deficiencies in defence equipment maintenance, glaring gaps in provisioning basic military hardware point to poor planning and procurement policies. A combination of complacency, corruption and lack of effective leadership has brought things to such a pass. That the navy remains without a chief even a month after the incumbent stepped down points to serious procedural lacunae. Meanwhile, defence procurement clearly hasn't kept pace with needs and operational requirements of Indian armed forces. Whether it is foreign defence acquisitions, technology transfers or indigenous defence development through agencies such as DRDO, delivery and induction of critical military hardware continue to lag behind. NEW DELHI: This election, politicians are micromanaging their public image. While some have hired public relations officers to streamline their speeches, others are occupied with their looks. However, few can rival Colonel (retd) Devinder Sehrawat, the Aam Aadmi Party candidate from South Delhi. Sehrawat, who took voluntary retirement from the Army in 2006, has been going around the constituency donning a T-shirt of the colour of fatigues and a cap that is generally associated with the Army uniform. In fact, the cap has the insignia of the Indian Army. "I have participated in many battles. I used to wear the combat dress then. This isn't exactly a combat dress but looks like one," said Sehrawat when asked if this could be a violation of the poll code. "In the original combat dress, Armymen wear a shirt while I am only wearing a T-shirt of the same colour," he added. said, "No candidate can wear Army uniform while campaigning. But, 'resemblance' is decided on a case-to-case basis. The exact dress has to be seen for the impression it conveys." Only recently, the poll panel had warned General (retired) V K Singh, the former Army chief and BJP's candidate from Ghaziabad, against introducing himself as the Army general, following complaints. The AAP candidate, a known RTI activist, said the election is just another battle for him. Sehrawat had also contested in the assembly elections from Bijwasan but lost to the BJP candidate by about 2,400 votes. He is pitted against Congress MP Ramesh Kumar and BJP's Ramesh Bidhuri. "I will fight this political battle to end corruption and the monopoly of two parties, Congress and BJP which ruined Inida," he said. And, he is not alone. Several retired Army officers and jawans are strategizing, planning and campaigning to win this battle for him. A 'war room' has been set up in Mahipalpur village, where Sehrawat comes from, to this end. "In the Army, all activities are planned in the war room, from mass movement of troops and equipment to making an estimation of the enemy. 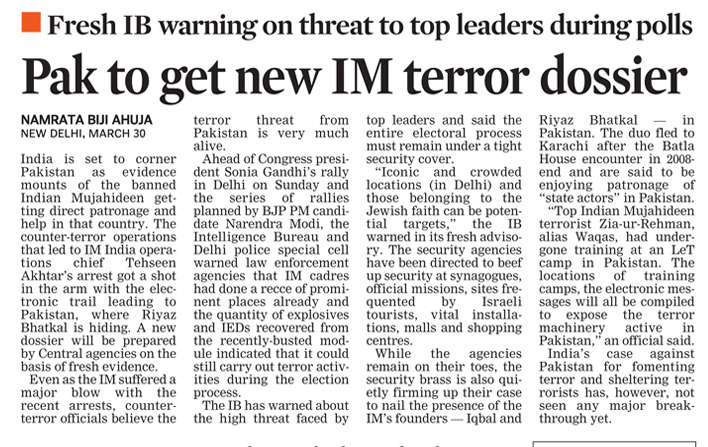 We are replicating this strategy to cover maximum ground," says Colonel (retd) Jaivir Singh, in charge of the party's poll campaign in South Delhi.